PCI DSS Compliance is the security standard that the payments industry uses to specify the guidelines that businesses need to follow for handling, processing or storing credit cards. The guideline that pertains to the storage of credit cards states that although it is permitted, it is discouraged against and must be done in strict accordance with specific rules. Simply stated it is better to store them outside of your organization in the safest manner possible. That is where the Authorize.Net™ Customer Information Management or CIM© add-on becomes important for your organization. QB EzPay lets you to store any of your customers payment methods in a safe and secure manner using the CIM© thus allowing them to be used for future transactions without needing any of the sensitive payment information ever again. Unlimited Credit Cards as well as Bank Accounts may be stored and are automatically linked back into a related Customer record within QuickBooks™ and are easily managed using the EzCustomer tool within the QB EzPay application. EzCustomer is the tool within QB EzPay which allows you to manage the payment methods that have been stored for your customers. Credit Cards and Bank Accounts can be stored for any customer within QuickBooks™ and easily accessed by selecting one from the list. These methods can be used for processing transactions with EzInvoice and EzReceipt and several other areas of the system. When processing a payment with the EzInvoice or EzReceipt tool, all payment methods can be automatically stored and linked to a customer as they are processed saving you the need to create a CIM© profile first. 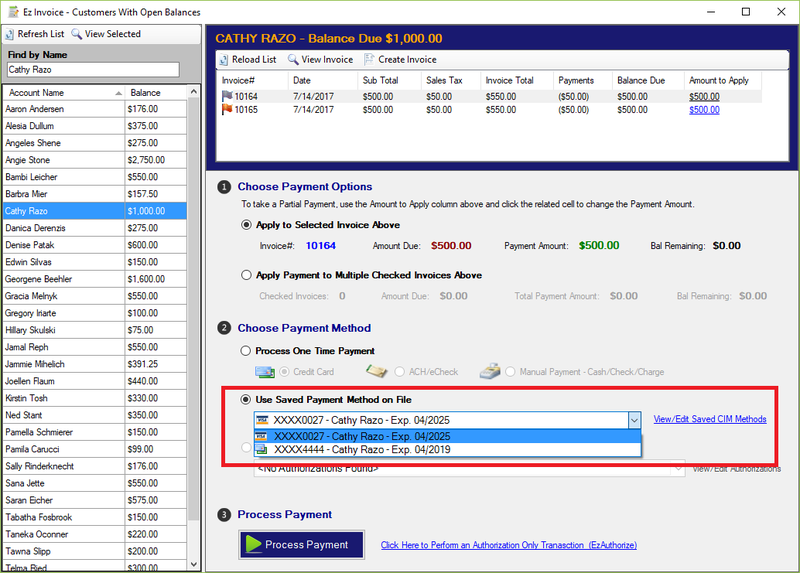 Existing CIM© users also have the ability to import any existing payment methods and relate them back to the specific record within QuickBooks™. The search process happens automatically whenever a new payment profile is created for a customer. 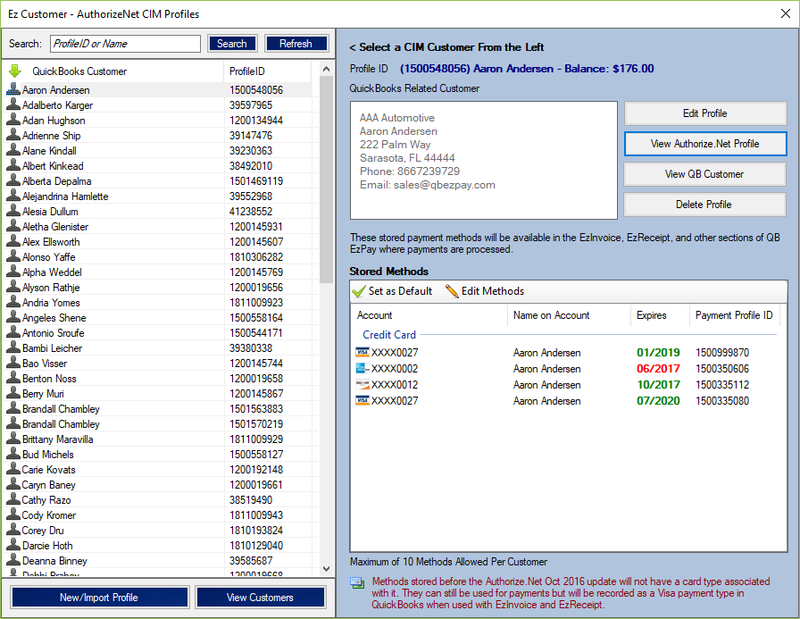 Once a payment method has been stored in the CIM© using QB EzPay, it can be used to process payments directly to Invoices and Sales Receipts within QuickBooks™. If a selected customer has a stored payment method already in the system it can be used by selecting the correct account from the drop down list. If a customer doesn’t have a stored method in the system it can optionally be automatically saved once their first payment is approved by Authorize.Net™.